« What is the reference point to measure ST elevation in STEMI ? CCU riders : ST depression + Rest angina is not equal to unstable angina ! Thrombus laden plaque is sine qua-non of UA/NSTEMI . That’s what we have been taught ! right ? It may be true in many situations , but please remember there is another concept called demand ischemia , where in there is no active thrombus , still resting angina may occur due to increasing heart rate etc. I just wanted to test how far this concept is understood , by the fellows in our coronary care unit . Following is story of a patient who arrived at CCU with angina at rest . I showed this ECG asked them the management . History was purposefully blinded . 5/6 cardiologists wanted to admit the patient either in CCU or rush to cath lab. Heparin/ Fondaparuinux was prescribed by all. Tirofiabn was suggested by few.It is a high risk UA with left main disease some one mumbled . The fellows realised the importance of history . In fact no body asked for it ? I felt bad as all my fellows failed in this test That reflects bad teaching on my part ! 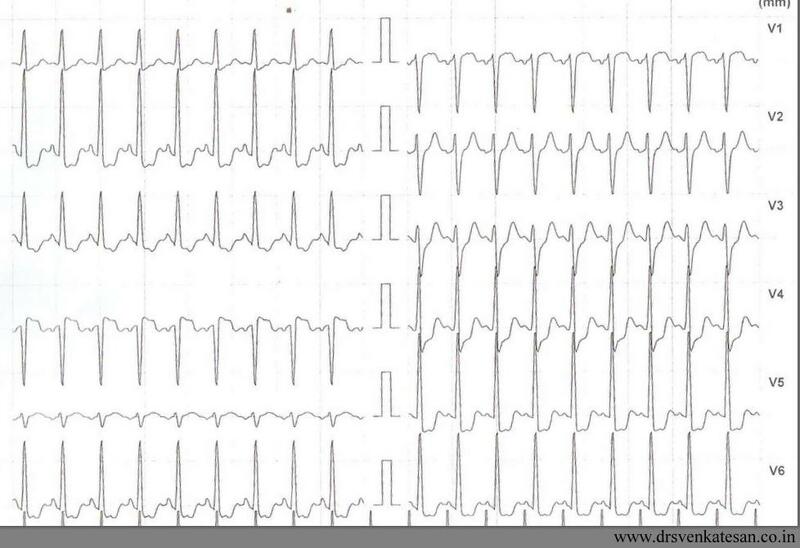 What is the mechanism of ST depression here ? Combination of high rate and probable flow limiting lesion . Do not label an ECG straightaway as acute coronary syndrome when there is baseline tachycardia and ST depression . Spare few minutes and apply your mind ! If a combination of ST depression and angina can be taken synonyms with UA every EST positive fellow should be labeled as UA and admitted in CCU. Please remember any tachycardia with a fixed tight lesion will mimic UA . Further , since there is no thrombus here and there is absolutely no role for heparin.